Another day, another bezel-less smartphone. This time around, Gionee has dipped its toe into the hottest 2017 smartphone trend with the M7 Power – a smartphone that complements an edge-to-edge display with a mammoth 5,000mAh battery. At Rs 16,999, the M7 Power aims to compete with similarly priced bezel-less wonders likes the LG Q6+ and the four eyed Honor 9i. Thanks to the 5,000mAh battery inside, the M7 power is really chunky and hefty – 8.6mm thick and weighing in at 199 grams. The build quality is excellent with no creaks and rattles to be found anywhere. The smartphone is available in three colours – Gold, Blue and Black. The M7 power comes with a 6-inch ‘FullView’ display that flows from one edge of the device to the other. The display is one of the USP’s of the smartphone – but it is actually a bit of a mixed bag. On one hand, it has a tall 18:9 aspect ratio and 2.5D glass that aids in-hand feel but on the other hand the resolution is just 1440 x 720 – HD+ in other words – which is disappointing to say the least. 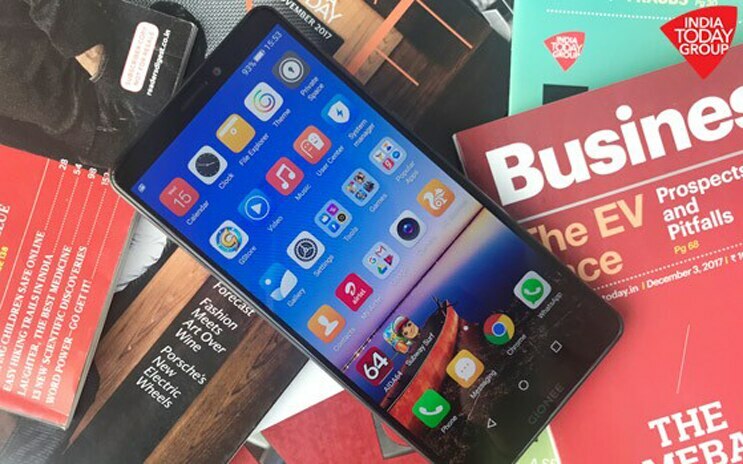 The biggest talking point of the M7 power is the fact that it comes with a massive 5,000mAh battery which Gionee claims can power the phone for up to two days on a single charge. It also supports fast charging which is icing in the cake. The combination of a mammoth battery and the ability to top it up quickly should make the smartphone a great option for road warriors. The rest of the specifications are average at best. The M7 power comes with the Qualcomm 435 processor, 4GB of RAM, the Adreno 505 GPU and 64GB of internal storage which can be expanded via a microSD card (of up to 256GB). On the software front, the smartphone runs Android 7.1.1 Nougat with Gionee’s own Amigo 5.0 custom skin on top. It ships with the September 5,2017 Android security patch. There is no word as of now regarding the Android 8.0 Oreo update. The M7 Power supports 4G VoLTE, Wi-Fi 802.11 b/g/n, Bluetooth 4.2 and GPS/ A-GPS. It comes with a microUSB port for charging and data transfer and has a 3.5mm headphone jack which is fast becoming a rarity in today’s smartphone world. Unlike Oppo and Honor’s offerings in this segment which come with four cameras and front cameras with artificial intelligence features baked in, the M7 Power makes do with a much simpler camera arrangement. There is a 13MP auto-focus camera at the rear with an aperture of f/2.0 and an LED flash which is accompanied by an 8MP fixed focus front facing camera with an aperture of f/2.2 for selfies. The Gionee M7 Power has a nifty trick up its sleeve – the ability to shoot 3D Photos. The phone can form a three dimensional dynamic picture of on object – all you needs to do is pan around the same. The Gionee M7 Power has been launched in India for Rs 16,999. It is set to go on sale across Amazon India and all major retail stores from November 25 onward. The M7 Power can be pre-booked on Amazon starting November 17. It will be available in three colour options – Gold, Blue and Black.